Good-bye room temperature liquids, introducing the MalloMe 30oz vacuum insulated tumbler! This tumbler has a double walled exterior with a vacuum between the walls. This means that there are no air molecules between your drink and the exterior. The transfer of heat or cold from your beverage to the outside world is virtually eliminated. Your drink will truly stay as hot or cold as science allows. Even filled with ice or boiling water, the bottle will never sweat or get hot to the touch! 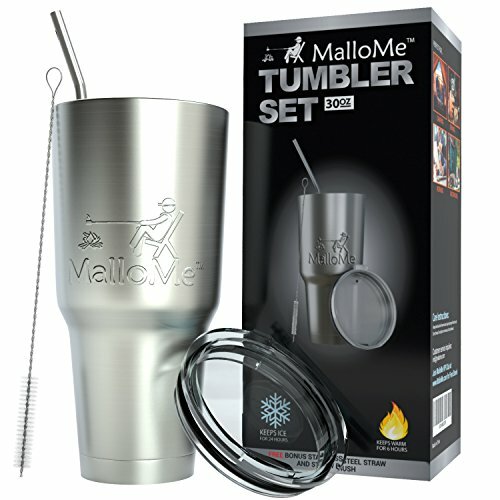 The MalloMe insulated tumblers are made of high quality food grade 18/8 stainless steel. Whether you are drinking water or coffee, this tumbler will not retain the taste or smell of any liquid. We offer a lifetime guarantee because we believe you will love the quality of this bottle. A sleek and durable lid is included for easy drinking and to keep your drink insulated! With the extra straw for sipping and handle for gripping, the MalloMe tumbler makes for the perfect travel companion. This tumbler is perfect at keeping you hydrated at the office, while camping, on road trips, hiking, cycling, golfing, shopping and so much more! Use as a travel mug, coffee cup, tea cup and water bottle. Performs as well as or better than Nalgene, Hydro Flask, Yeti Coolers Rambler, Rtic, Ozark Trail, Contigo and Thermos bottles. These tumblers are FDA and LFGB certified, they do not contain any hazardous material. SAVE YOUR HARD EARNED MONEY! - No need to spend double or triple the amount on the 'brand name' when we are just as good (if not better), half the price, AND include all 3 accessories free of charge! Check out our reviews and compare! 5 stars ALL THE WAY! ENJOY YOUR BEVERAGE COLD or SIP IT HOT - Now includes a crystal clear tumbler lid! Double wall vacuum insulated tumbler maximizes temperature retention & insulates hands from the cold or hot- Keeps ice for 24+ hours and warm 6+ hours - Great as a coffee travel mug! 4 Piece Set Includes 30oz tumbler + stainless steel straw + open hole lid + straw cleaning brush. MAKE YOUR LIFE MORE COMFORTABLE - Versatile & Mobile - Narrow & tall design fits more cup holders and makes life that much easier - The set includes a FREE crystal clear tumbler lid, stainless steel tumbler straw, and straw cleaning brush for all our customers! Disclaimer: Not affiliated or distributed by Yeti Tumbler LLC, SIC, Ozark Trail or RTIC.